Below-par putting technique can dampen any performance. Take to the green with confidence by mastering your putting technique using this dual-speed putting mat. Not all greens are the same - the putting mat comes with two textures to replicate the feel of two completely different greens. There's no need for your vital putting practice time to be interrupted, as the fully extendable and simple to move dual-speed putting mat is suitable for both indoor and outdoor use. Play goes on with your personal putting mat whatever the weather! Thanks to the integrated ball return system, the monotonous practice of collecting your ball post-putt is a thing of the past. The mat is 10ft in length and 1ft in width. The extended FORB golf range includes a variety of high-quality products. BALL RETURN SYSTEM: Take the time to celebrate each successful stroke, as the ball return system gets to work. 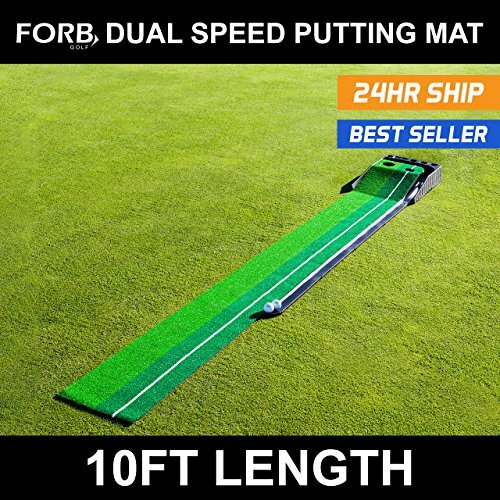 EASY TO TRANSPORT: The 10ft long putting mat is suitable for golfers on the go as its rubber base extends and rolls for hassle-free transport. MULTI-USE: Savor the sunny days in the garden, or emulate your golfing heroes in front of the TV, as the dual-speed putting mat can be used indoors as well as outdoors. UNPARALLELED DURABILITY: Practice for as long as you like - the duel-speed putting mat features robust rubber backed turf for added stability. FAST DELIVERY: Net World Sports offer quick and secure delivery! If you have any questions about this product by FORB, contact us by completing and submitting the form below. If you are looking for a specif part number, please include it with your message.